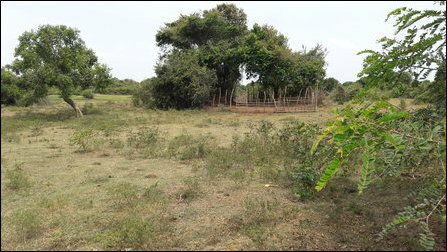 The so-called Forest Conservation Department of occupying Colombo has seized a small pond, known as Ka'lik-ku'lam, and almost 500 acres of lands in the vicinity of Unnichchai 6th Mile Post. The Eezham Tamil villagers have been using the area for Cheanai (slash-and-burn) cultivation for decades. 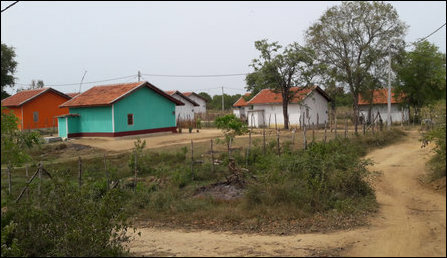 The villagers, who have resettled after the end of war and who also received housing through the ‘National Housing Development Authority’, complain that they are unable to continue with their livelihoods of agriculture, fresh-water fishing and animal farming as a direct consequence of the latest occupation, which has been carried out by the SL Forest Department. 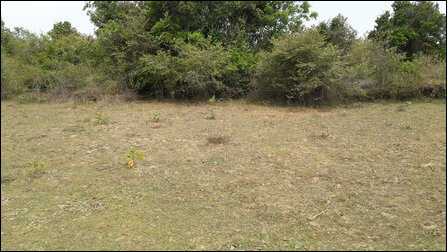 Creating borders with bulldozed bushes and by planting borderstones embedded with GPS devices, the SL Department has also moved on to plant saplings of Theakku trees (teak, Tectona grandis), depriving the native people their Cheanai cultivation lands as well as agriculture, fishing and animal farming. 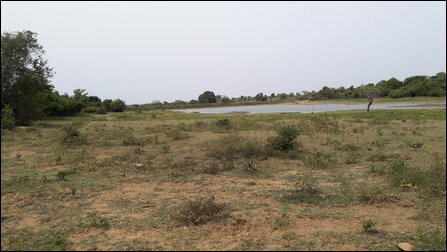 Around 120 families are dependent on the lands for agriculture and the pond to channel water for their cultivation, to engage in fresh-water fishing and to provide water for their cattle. The village, situated in Ma'n-munai West (Vavu'natheevu) division, was previously under the de-facto administration of Tamil Eelam during the times of independence war and the peace process. 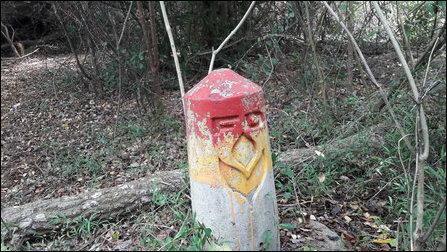 However, after the genocidal end in 2007 in the East and 2009 in the North, the occupying Colombo is advancing a wide-scale structural genocide targeting Paduvaa-karai for Sinhalicisation through various departments coming under its central ministries based in Colombo. Although many Tamil families were living at Unnichchai 6th Mile Post, housing by the NHDA has only been provided to a few of them. 04.01.19 Tamil dairy farmers face two-frontal attacks in in..
14.12.18 SL military threatens to re-introduce discriminato..
10.12.18 HR Day protests in North-East met with violence, S..
08.12.18 Occupying Colombo reintroduces war-time harassment..
01.12.18 Occupying Colombo intentionally targets ex-LTTE me..
29.09.18 Sinhala colonists resume occupation of pasture lan..
21.09.18 Pasturelands converted into agricultural lands thr..
25.08.18 Sajith Premadasa's ministry revives Sinhala coloni..
16.07.18 SL Forest Department seizes agricultural lands of ..
20.05.18 SL Forest Dept, SL Police continue to harass Tamil..
21.04.18 Sinhala guards assault Tamil cattle-herders in Bat..
04.04.18 Sinhala colonists attempt to rob Tamil cattle herd..
24.03.18 SL authorities in Ampaa’rai harassing Tamil farmer..
24.02.18 Increasing reports of Sinhala colonists gunning do..
13.02.18 SL court in Aralaganwila discriminates Tamil dairy..
31.01.18 SL Police, Forest Department connive against Tamil..
30.01.18 Organised rings backed by occupying Colombo exploi..
23.01.18 Colombo’s ‘development’ crime evicts one-third of ..
18.01.18 Karuna paramilitary appropriates pastureland in Pa..
05.01.18 Colombo steps up structural genocide against Paduv..
25.12.17 Sinhalicisation targets interior hill-top northwes..
04.12.17 Sinhala colonists resume violence against Tamil fa..
09.11.17 World Bank to fund genocidal Sinhala colonisation ..
22.09.17 Sinhala colonisation stepped up, genocidal system ..
19.09.17 Tamil village in Batticaloa-Polonnaruwa border Sin..
14.09.17 Sirisena’s Mahaweli ministry twists old records to..
13.08.17 Colombo's Intelligence harasses families of re-uni..
02.08.17 New Sinhala police station disturbs peace in reset..
28.05.17 Rigid military ‘pass system’ continues to restrict..
26.05.17 Sirisena diverts water away from Tamil farmers to ..
11.05.17 No action from Sirisena on withdrawing Sinhala col..
10.01.17 Sinhala Buddhist monks assault Tamil cattle-herder..
07.12.16 It is time for SL President to act against extremi..
03.12.16 Extremist monks march towards Batticaloa, Tamil an..
30.11.16 Sinhala colonists harass Tamil GS officer threaten..
22.11.16 Muslim, Tamil politicians not bold enough to confr..
18.11.16 Monk-talk reveals realities set by imperialisms ri..
11.11.16 Led by extremist monk, Sinhala colonists launch ha..
02.11.16 Sirisena deploys ‘pass restrictions’ to block Tami..
03.10.16 Colombo stands further exposed by contradictory me..
02.10.16 Sinhala colonisers in Batticaloa challenge officia..
25.09.16 SL military, Buddhist monk bring Sinhala ‘War Hero..
21.09.16 Sinhala colonists step up assaults on Tamil cattle..
14.09.16 Sinhala colonists advance 3 km further into Battic..
06.09.16 Sirisena's Mahaweli Ministry spearheads massive-sc..
22.06.16 Structural genocide targets Kudumpimalai despite T..
10.06.16 Attacked GS officer gets harassed while SL police ..
08.06.16 Family receives death threat for alerting GS offic..
02.06.16 SL military brutally assaults Tamil Village Office..
06.05.16 Protest by dairy farmers brings EPC Minister, GA t..
03.05.16 Maithiripala’s structural genocide targets Tamil c..
01.02.16 Resettelement of Tamils confronted on several fron..
16.01.16 Sirisena's Mahaweli Ministry continues demographic..
05.10.15 Sirisena's ministry, SL military seize more pastur..
14.06.15 Sinhala occupation of pastureland causes existenti..
13.06.15 Colombo continues to deploy Wildlife Department as..
29.05.15 Violence intensified in Sinhala military-driven de..
06.05.15 Why no Gazette notification on release of lands, a..
16.04.15 Sinhala colonization continues unabated in pasture..
28.01.15 Sinhala occupation continues at gunpoint in East d..
02.10.14 SL military enslaves Eezham Tamils along border vi..
07.08.14 Occupation of grazing lands in Batticaloa is big s..
09.02.14 Tamil cattle farmers complain of Sinhala occupatio..
07.02.14 Buddhist monk, Sinhala squad appropriate lands alo..
26.01.14 Current realities of demographic genocide in Batti..
28.12.13 Colombo’s wildlife department appropriates lands i..
14.06.13 Sinhala military wants ‘Kappan’ from Batticaloa Ta..
25.02.13 Attacks against Tamil farmers escalate in Vellaave..
09.02.13 Sinhala paramilitary attacks Tamil dairy farmers i..
02.12.12 Sinhala paramilitary attacks Tamil cattle farmers ..
11.11.12 Colombo plans to settle 25,000 Sinhala families in..
10.10.12 Sinhalese occupy grazing lands of Tamil cattle bre..
03.03.12 Land grabbed for Buddhist stupa, local people bloc..
09.12.11 SLA grabs 3,500 acres of land in Batticaloa for Si..
04.12.11 Strategic Batticaloa borderland appropriated for c..
17.10.11 Sinhalese given lands in Tamil villages in East un..
11.10.11 Forest destruction, land grab go unabated in Batti..
05.10.11 Sinhala encroachment of grazing lands continues un..
21.09.11 Colombo schemes Sinhalicisation of Batticaloa with..
21.12.10 Mahinda doctrine deprives Tamils of irrigation in ..
09.07.10 SLA changes traditional Tamil names of streets in ..
03.05.09 Sinhalese colonization of Tamil village in Eastern..
26.08.08 SLA restrictions affect cattle owners, farmers in ..
20.05.08 USAID reconstructs milk chilling facility in Vella..
12.09.07 Paduvaankarai IDPs' cattle to be appropriated – Ba..
04.07.03 Techniques to improve milk production discussed in..